The Congressional Research Service (CRS), known as “Congress’s think tank”, has recently sent two reports concerning the Article V Convention to their chief audience-members of Congress and their staff. Entitled, “The Article V Convention for Proposing Constitutional Amendments: Historical Perspectives for Congress (July 10, 2012) and Contemporary Issues for Congress (July 9, 2012),” the confidential reports were made available on the Federation of American Scientists’ Project on Governmental Secrecy webpage. The Article V Convention (AVC) is a method to amend the constitution by bypassing Congress-an action more and more Americans are prone to support as confidence in the Federal government has plummeted to all-time lows. People are waking up to the fact that the well-traveled road of electoral and party politics is where good ideas go to die, and consequently, more voters are choosing to self-identify as independents. A recent Rasmussen poll from late June 2012 found that 53% of likely U.S. voters say that, “neither party in Congress is the party of the American people”-an all time-high. The compound effects of this overwhelming dissatisfaction with Congress has contributed to the birth of contrarian and anti-establishment movements such as the Tea Party in 2009, and the Occupy Wall Street movement in 2011. 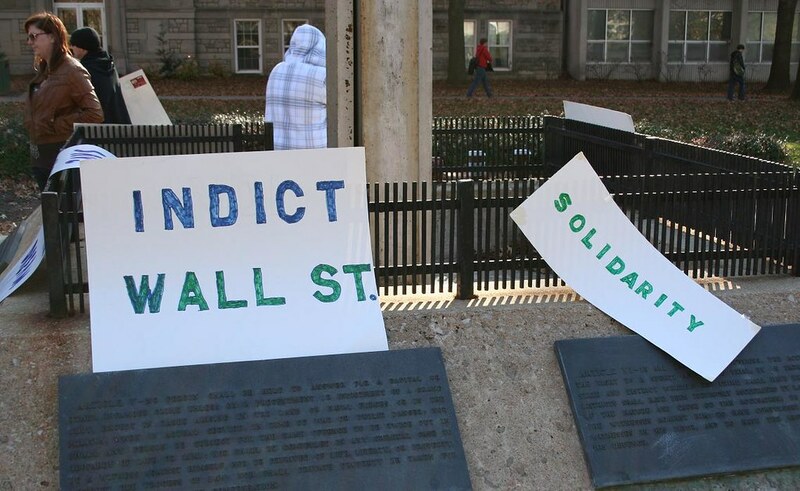 Although the Occupy Wall Street movement has largely steered clear from traditional electoral politics-in many respects, both the Tea Party and Occupy movements have either been marginalized or made subservient to the interests of the status quo. To date, neither the Tea Party nor the Occupy movements have succeeded in coercing substantive changes in the way the Federal government conducts the business of the people. Time after time, traditional efforts toward political action have been co-opted, stymied or blocked, and organizations like the Friends of the Article V Convention (FOAVC) advocate for a new front to be opened, where new possibilities and real hope for change can flourish. The frustrations born from a lack of representation in Congress have led activists from across the political spectrum to pursue untried measures, namely, the Article V Convention which bypasses corrupt Federal political processes. FOAVC’s position is that not only has the requirement been met to trigger the Article V Convention as early as 1911, but that Congress has cynically disregarded their constitutional duty to call the convention in favor of protecting a de facto monopoly power over the amendatory function. This puts members of Congress in a legal quandary as they’ve all sworn an oath to “support and defend” the U.S. Constitution, and yet-if FOAVC’s position is correct-have brazenly ignored the direct and simple command of Article V, thereby violating their oaths of office, a felony criminal offense. The growing support and awareness of Article V has prompted the Congressional Research Service to generate two white papers on the implications of this untapped resource being utilized. To wit, the Founders and Framers placed the convention method in the heart of the U.S. Constitution to provide the people with a means to exercise their right to “alter or abolish” when the Washington establishment has shown itself to be largely ineffective, tone deaf and unresponsive to needs of the people and nation. Neale credits the rise of social media and information technology with creating a political environment where the speedy emergence of a movement toward an Article V Convention could become a very real possibility. The CRS white papers also point to the fact that Congress or the National Archives have never kept a record of state applications for an AVC, forcing the government to rely on the Friends of the Article V Convention’s independent research of the Congressional Record. Article V of the constitution provides two methods for amending the U.S. Constitution. The first is by a vote of two-thirds of both the U.S. House and Senate to pass an amendment, which then needs three-fourths of the states to ratify the amendment into law, thereby affixing it to the supreme law of the land. This process has occurred 27 times in the history of our nation. The second method is through an Article V Convention, which is called into session when two-thirds of the states have applied for one (a threshold that’s already been met). The convention debates different ideas and then votes on them. Aspiring amendments that have been successfully passed by the convention then need to follow the same track as the first amendatory method-ratification by three-fourths of the states. This strict requirement prevents any extreme or radical proposals from surviving-the Founders would not have been so shortsighted as to place a self-destruct switch in the center of their masterpiece. People are out in the streets all over the world. We’re fed up with the status quo, so we chuck our tribal spears–democracy in its most primordial form. Where the Tea Party angst was co-opted and diverted toward traditional electoral politics–in the form of supporting Republican candidates–the Occupy Wall Street movement is playing the long game, and wisely so. Now the problem with bottom-up, non-hierarchical, decentralized, grassroots democracy, is that pretty much, anything goes. So this quasi-top-down dictate from one OWS website, distancing itself from the 2012 election, could be brushed away in a moment if found to be no longer convenient nor useful. Course this “anything goes” aspect could also be considered a virtue and saving grace–certainly a flexible form and model that best replicates the characteristics of the only examples of true sustainability we have, which are natural ecosystems. Fleet of foot and adaptable. The pier-to-pier, or “peer-to-peer” democracy we see on the internet is a living and evolving example of experimental adaptability mirroring Mother Nature’s capacity to contend with shifting environmental and biological conditions, ergo, maintaining balance within a system. We would like to see what we see possible within the information universe to be made real in our real universe. In many ways, this is a simple translation, like having a thought and then acting on it. This is why 2009’s “Twitter Revolution” happened in Iran and why people are out in the streets in Cairo, Wall Street, elsewhere. People see the connections, possibilities, and “own” them within their virtual world, and are now demanding those hopeful possibilities in our real world. There’s a movement going on–people are waking up. Of course there are all sorts of geopolitical idiosyncrasies within each unfolding narrative–I definitely understand the mammoth distinction between being peppered sprayed at U.C. Davis versus the tragic loss of life, the martyrs for democracy in Algeria, Egypt, Libya, Yemen, Syria, etc. One is an outrage–the other, an abomination. But people who refuse, or are incapable, to see the connections between the Tea Party, Occupy Movements, protests in Europe and Middle East, just don’t “get it”. But we do. Take the ‘R’ out of Revolution and Evolve! I tried to unpack what a sustainable socio-economic system (SSES) would look like back in 2004 for my Global Peace Solution television broadcast for the Middle East and Iranian Diaspora. I also referred to this as governance made of life and for all life–if you will, an addendum to “by, for, and of the people”. We are seeing these kinds of evolutionary ideas expressed within the global movement, within OWS, the seeds are being planted and are bearing fruit right now–making history and transforming our world. One idea that I think is perfectly tailored for the moment, is the Article V Convention method of altering or abolishing government that no longer works for the people. Certainly, the unholy tryst twist Washington and Wall Street is one of the first log jams that needs to be untangled “Gordian knot” stylie. In this case, an Article V Convention is akin to Alexander the Great’s sword. It’s a remedy embedded in the simple direct language of the constitution–and the solution has the people staging an intervention, allowing for significant change to occur outside of Washington and removed from traditional electoral corruption; a strategy precisely in tune and consonant with the OWS worldview. A new way, that opens a new front. Many dismiss the notion of a convention because they don’t understand it, or they think it will be just as corrupt as what we currently suffer in Washington and Wall Street. But the fact remains: what we have now is corrupt, and that’s why we need to open new arenas through which our case for transformation can be heard. The old “change we can believe in” thing (i.e. electoral politics) is not working for the people any more–and many veterans within our sacred social change movement will readily concede that the mainstream political parties is where movements go to die, co-opted and compromised into irrelevance. The Founders actually did envision the current state of the nation. They could foresee an intractable situation befalling the Republic in which undue influence and corruption would become so entrenched into our political institutions, that elections–or any actions taken by the Federal Government–would be incapable of addressing America’s biggest problems. Sound familiar? What the designers of our constitution foresaw was the distinct possibility that the same kind of centralized tyrannical power they had just opposed and defeated (the British Crown and Parliament) could potentially materialize over time in the new nation. They unanimously agreed to incorporate a switch that could be flipped in the future to convene a group of citizen delegates charged with addressing what was broken. That switch is called an “Article V Convention”, and contrary to popular myth, it is not a self-destruct button. An Article V Convention allows citizen delegates to produce a roster of ideas for each state to consider to approve as a US Constitutional Amendment. There are sufficient protections built-in to prevent any kooky, radically partisan, or extreme ideas from surviving the two-step nomination and ratification process. If you believe in the brilliance of the Founders, you cannot presume to think that they would have been so idiotic as to put a poison pill right in the heart of the constitution. The convention clause was seen by the Framers as a necessary check-and-balance, and has the potential to reboot the Federal laptop that’s been locked-up and frozen for years. While banging on the keys may seem like it’s working (elections), if you really want to get something done, Article V is the reset switch. Things are happening, people are waking up to the fact that extraordinary times require extraordinary measures. Occupy Wall Street and Tea Party should dust off an old-but-never-used constitutional remedy, an Article V Convention. If you’re in search of truly transpartisan solutions, and are not satisfied with electoral politics, check out this time-capsule gift from the Founders: the amendatory convention enshrined in Article V, an idea whose time has come–and whose design was scrupulously intended for present circumstance. And he’s a pompous blowhard, too. Paul Krugman: ….And Newt, although, uh, somebody said, he’s, he’s a stupid man’s idea of what a smart person sounds like…. 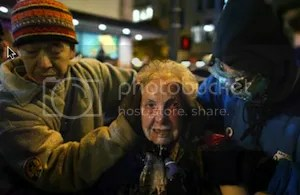 Newt Gingrich (r): ….Let me, let me now take that, and for a brief moment describe Occupy Wall Street. All of the occupy movement starts with the premise that we all owe them everything. They take over a public park they didn’t pay for, to go nearby to use bathrooms they didn’t pay for, to beg for food from com, places they don’t want to pay for, to instruct those who are going to work to pay the taxes to sustain the bathrooms and to sustain the park, so they can self-righteously explain that they are the paragons of virtue to which we owe everything. Now, that is a pretty good symptom of how much the left has collapsed as a moral system in this country and why you need to reassert something as simple as saying to them, go get a job right after you take a bath [applause]…. ….business analyst Harrison Schultz and professor Hector R. Cordero-Guzman from the Baruch College School of Public Affairs, today released a study based on a survey of 1,619 visitors to the occupywallst.org site on October 5. And about a quarter of them have also attended occupation events. So they aren’t all armchair activists…. ….“Get a job!” wouldn’t apply to most of them. Half of the respondents are already employed full-time, and an additional 20% work part-time. Just 13.1% are unemployed–not a whole lot more than the national average…. If God exists she will make Newt the republican nominee. We can only pray, and cross over to vote in the republican primary. Ani Ucar, Aggie TV (UC Davis): This is Ani Ucar reporting with Aggie TV. I’m standing outside of Surge Two where a press conference was held with Chancellor Katehi and Chief Spicuzza in an effort to address the events that happened Friday, November eighteenth. Student voice (via people’s mic): They could have held it in a bigger room. This is a university. There are huge lecture halls. We should be able to participate in this press conference. Ani Ucar: The private news conference was interrupted when protesters entered the building unexpectedly, leading News Service Director, Claudia Morain, to cut the conference short. Student voice (via people’s mic): The proposal is we give Katehi a safe way out. They want us to close the door while they consider our proposal. Ani Ucar: Protesters formed lines around the building, clearing a path for the Chancellor to walk through. Student voices (chant): Hey, hey, ho, ho, Katehi’s got to go. Ani Ucar: Nearly three hours passed as protesters chanted for the Chancellor to exit the building. One protester was allowed to return inside to represent the group and negotiate with administration. Hundreds lined the curbs, watching in silence as the Chancellor was escorted to her car. The Occupy movement isn’t going away anytime soon. 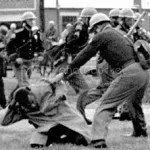 I don’t know how to break it to you, but police brutality in the service of the one-percent has always been the institution’s reason-for-being in the United States of America. One need only look at the history of policing in America to arrive at the realization that fealty to the rich has been ingrained in the institution since it’s inception. Just trace the arc as policing moved from a function of the community to a function of the state — and that move was in service to rich people. There has always been a mechanism for maintaining the status quo. We won’t go all the way back to England and the middle ages and the evolution of policing from tythings and the tythingman that was charged with keeping order among his group of ten families in agrarian settlements. In colonial America, the community was charged with policing itself, and the punishment was geared toward humiliation of the offender, employing methods like stocks, dunking stools and scarlet letters to shame to rule-breaker. But as cities grew and industrialization emerged, populations grew too large to be controlled by constables and community mores. This paralleled the emergence of the wealthy industrialist and political classes that desired protection from the masses they exploited in order to gain their wealth and power in the first place. This is what the textbooks refer to as the political era of policing and it emerged in the crowded urban centers of the northeast in the decade between 1830 and 1840, and uniformed police were the norm in every established urban center in the country by 1850. From the outset they worked for the one percent, and private forces — emphasis on “force” — worked right along side the commissioned police officers of the era to break strikes and keep the rabble in line. Pinkertons, the favorite of the rich industrialist that wanted to — ahem — “discourage” unions from organizing famously called in the Pinkertons to bust heads along with unions, and in a pinch they could be counted on to offer falst testimony against troublemakers so they could be dispatched on the gallows, under the color of law. The most infamous case of this was the breaking of the Pennsylvania Miner’s Union in 1876. Twenty miners were accused of terrorism; allegedly for being members of the Molly Maguires, a militant Irish group. None were members, but the testimony of a Pinkerton agent got them sentenced to hang, and the negative publicity from the case effectively killed unionizing in Pennsylvania for two decades. The so-called “tea party” was allowed to brandish weapons and hold up signs that proclaimed violence (“If Brown can’t stop it, a Browning can” at an anti-healthcare-reform rally) because they were, in effect, demanding the status quo remain unchanged. But every time the status quo is threatened, the police are deployed against the masses by their masters. We see it when we look at the unionization era of the late 1800s and early 1900s. 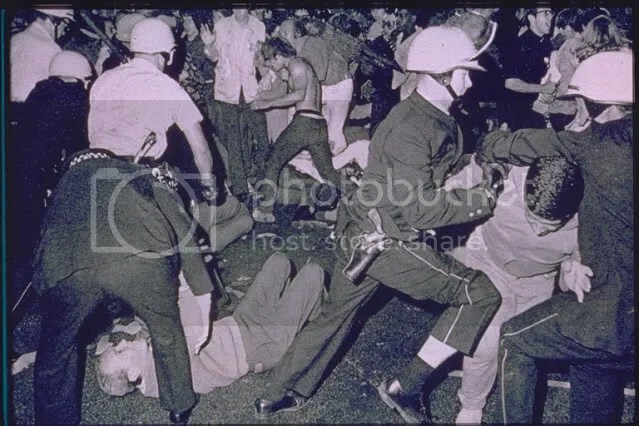 The massive violence against unions and working people — the 99% — is bookended by the Pennsylvania Miner’s Union organizers I mentioned above and the Matewan Massacre in West Virginia in 1920, when the police joined the miners who were fighting back. When the smoke cleared and the dust settled, seven union-busting hired guns from the Baldwin-Felts Detective Agency lay dead, including the two brothers who were in charge of the contingent; along with four townspeople, among them the mayor. Matewan was the turning point. It also took the better part of five decades to arrive at that point, and the road went through Haymarket Square in Chicago and Ludlow, Colorado. 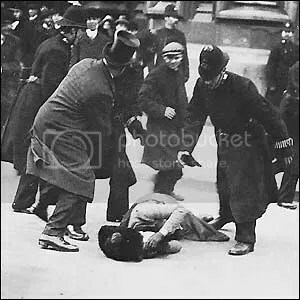 We saw the same sort of police violence directed at Suffragettes as we saw directed at unions. Why? 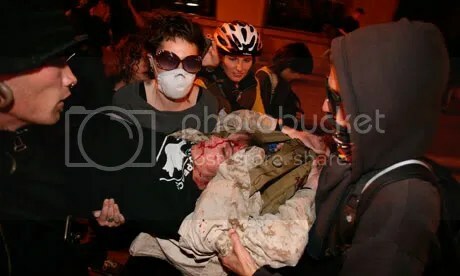 What did these peaceful women do to deserve the brutality directed at them? They threatened the status quo. They threatened the white, male power structure. If women were granted the vote and a say in how things were done, the power of the ruling class would be diluted. We see police brutality every time the status quo is threatened. And the 99%/Occupy Wall Street movement are a threat the likes of which the status quo hasn’t faced in decades, if ever. The fear of the 1% is evident in the violence they are eager to unleash their uniformed thugs to perpetrate. 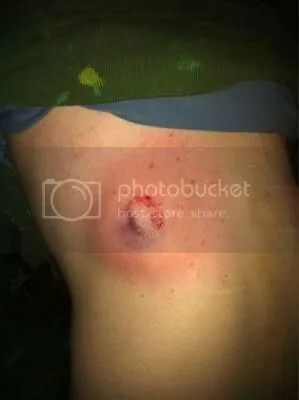 And that is what underlies the bold and arrogant nature of the police as they attack protesters. We saw it from the beginning when the white-shirt Tony Baloney maced women who were penned behind orange mesh and posing no threat. …and fired rubber-covered bullets at them. We saw it in Seattle last week. The police, who moments before had been pointing firearms at the students take their toys and go. UPDATE: GMTA, I guess….My friend Imani (@AngryBlackLady) is on this, too, and she has the contact information for UC Davis. Including the police officer who busted out the pepper spray. “…It needs to be a little bit more egalitarian. It needs to be more for the people than for the few. That’s how I feel about it…” – an Occupy activist, today, on the Quad at the University of Central Missouri, in a conversation with a few apparent Ron Paul supporters. Occupy the Quad – in conversation. 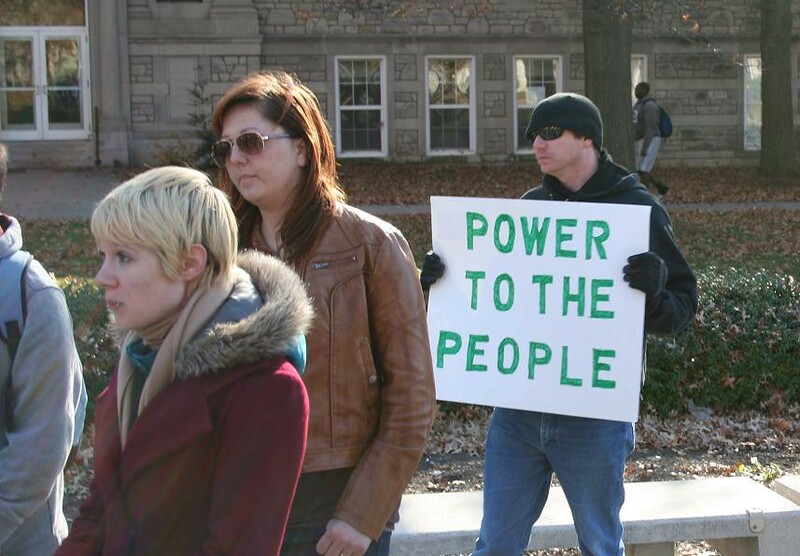 Several students held an Occupy demonstration on the Quad at the University of Central Missouri in Warrensburg today. We interviewed one of the students after she had been engaged in a lengthy conversation with three apparent Ron Paul supporters. The Ron Paul “supporters”, by their comments, appeared to defenders of Wall Street, corporatist apologists, anti-organized labor, and quite comfortable with exporting jobs overseas because that labor is “cheaper”. Show Me Progress: Why are you out here today? Kelley Dragoo: Um, I’m trying to raise awareness right now for the Occupy movement. Um, a lot of people on campus are uninformed or misinformed. And right now we’re just trying to raise, raise awareness and get, get people, um, to stop thinking about it and start doing something about it. Show Me Progress: Uh, so how long have you been out here this afternoon? 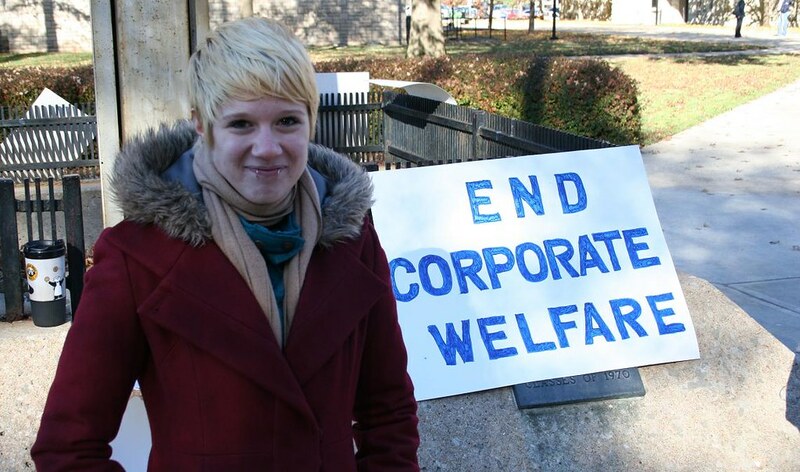 Kelley Dragoo, Occupy activist and University of Central Missouri student, on the UCM Quad in Warrensburg. …Show Me Progress: So, what, what kind of, uh, feedback have you been getting. Kelley Dragoo: Uh, I’ve gotten some pretty positive feedback. We’ve had, you know, we had a few hecklers. Somebody came by earlier this morning and told me that if I burned a flag he would punch me in the face. And I said, well, I’m not, I don’t plan on burning any flags [laugh]. Um, and, uh, I think, I think the overall aware, I think it’s just been an atmosphere of awareness, you know. I’ve had a lot of, um, a lot of one on one conversations talking to people and just letting them know what’s going on, um, about how our, our First Amendment rights are being challenged all over the nation right now. Uh, via the protests being slowly silenced, um, in New York City right now. Uh, they’re, they’ve been kicked out of Zuccotti Square on, they got kicked out of Zuccotti Square on Tuesday. Tried to, um, tried to, uh, get a restraining order against the police to allow them to stay there and continue, you know, protesting and, uh, push came to shove, and they, they got kicked out. And they’re, they’re not allowed to, to occupy with, with tents anymore. They’re allowed to protest, but, uh, they’re, the government’s doing everything in its power to kind of stifle it. And, um, it’s scary, you know, these are our First Amendment rights. And that’s happening, that, you know, that’s not just New York City, that’s Boston, Philadelphia, uh, San Francisco, I heard, I heard Dallas and St. Louis are having problems as well as Oakland. I know a lot of people knew what was going on in Oakland, but the problem is the media’s not, not doing anything about this. And if they are it’s in a very biased and negative sort of way. And it’s scary that, that we’re being silenced and, and no one seems to understand that. Show Me Progress: Uh, so, how long do you plan to be out here? Kelley Dragoo: Um, I’ll be out here until five o’clock today. But, like I said, I’m just trying to get people informed, um, and, and I’ve got, I, I have a sign up list, uh, trying to get people’s num, you know, information to get them activated. Uh, next semester I think is when we’re gonna go a little bit harder and, uh, try and get people more involved. That’s how you start building a movement. ….Hey, remember back when Republicans started showing up to health care town halls and outside Obama public events armed with rifles and the like, not to intimidate or threaten anyone but as a form of “political speech”? Yeah, camping is much worse. That was free speech with guns; this is free speech with camping. So you can see why they have to crack down. With police in riot gear, no less…. According to this official, in several recent conference calls and briefings, local police agencies were advised to seek a legal reason to evict residents of tent cities, focusing on zoning laws and existing curfew rules. Agencies were also advised to demonstrate a massive show of police force, including large numbers in riot gear. In particular, the FBI reportedly advised on press relations, with one presentation suggesting that any moves to evict protesters be coordinated for a time when the press was the least likely to be present…. ….Is that true? Maybe. But given that this information came from Examiner.com, the proper response is “citation needed.” Why? Because Examiner.com is Fox News light…. Your right to peaceably assemble for the redress of grievances, and how you may do it, and what you may say, will be defined by the police power of the state, backed by its political establishment and the business elite. They will define “acceptable” forms of public protest, even (and especially) public protest against them. This is the way it is now. This is the way it has been for some time. It’s just that people didn’t notice. And that was the problem with the Occupy protests. They resisted the marginalization – both literal physical marginalization, and the kind of intellectual marginalization that keeps real solutions to real problems out of our kabuki political debates. They could not be ignored…. ….That was the real problem with the Occupy people. They were being heard…. Slack-key celebrity Makana used his performance at an APEC dinner last night at the Hale Koa Hotel as an opportunity to get his pro-Occupy Wall Street movement views out to President Barack Obama and other world leaders. Makana wore an “Occupy with Aloha” t-shirt under his black blazer and sang his newest song, “We are the Many,” an anthem of sorts for Occupy protestors…. Makana: So I just came from playing the world leaders dinner at APEC, uh, here in Honolulu for the Obamas and, I guess, nineteen or twenty other world leaders. So I showed up and did my gig and I started to look around and I thought about this song I just wrote called “We are the many”. And it was an incredible experience to sing the words, those words, to that room of people. And I didn’t belt it out, I started out very subtly and subliminally. And I was like, ye come here gather ’round the stage, the time has come for us to voice our rage. Did he just say what I think he said? And then I realized that, wow, I didn’t get in trouble, so I played it again and I made it like a different version of it, ended up playing it for about forty-five minutes. To be able to sing that there was an epic feeling. It felt right. My uncle always told me, play what’s in your heart and play to the audience, you know, play what you feel is right for them. That’s what I did. And I found it odd that I was afraid to do it at first. I found that disturbing. That’s kind of why I did it. I didn’t like the idea of being afraid to sing a song that I created. I never in my life been afraid to sing anything. If that’s what we’ve come to in the world where we’re afraid to say certain things in the company of certain people, I think that’s a dangerous place to be. And so, for me to move out of that space I had to sing the song. And that’s what I did.